Imagine being a 9-year-old boy and looking up at your ceiling from your bed to view these awesome posters. He's setting his sights high with the Porsche Boxter RS60. His favorite car is the Saleen S7, and Doug put up a Ducati Monster 696 poster to round out the collection. It helps to have a post and beam house with beautiful wood ceilings to tack these up. Here's a peek at the other side of his ceiling three years ago. 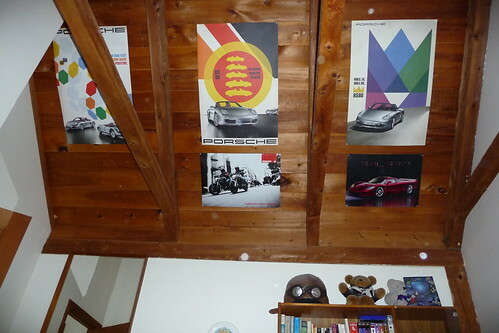 The lights are still there, but the Pixar posters have been replaced by yet more car posters. I WAAAAAAANT those ceilings! I am so jealous! The car posters are pretty rad too! My best friend had a room very similar to this when he was around the same age. He had a serious Porsche love as well. He got his wish at the age of 39. He held on to that dream for that long and got what he wished for. The irony was that when he was driving from Nevada where he purchased it to Seattle he missed a gear while on the hiway in the rain, down shifted and slammed the thing into the gaurd rail. It was in the work shop for the next 3 months. Funny now but at the time he was heartbroken. LOL, I'll bet he can't wait to turn 16! What a great way for a boy to personalize his room. With some fantastic cars, no less! Now that's a sight when you want to lie in your bed and day dream! Talk about motivation. Iremember doing the same thing as a kid. How cool! My boys haven't shown an interest in posters yet. 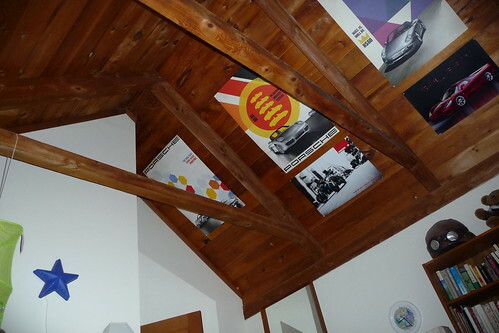 What a cool ceiling :) and those posters are so cool for him to have! What a great idea! I remember those days. I'm glad my mom was cool enough to let me put posters all over my wall. Awesome beam ceilings. My 16yo boy would love those posters too. I wanted to hang a Robert Pattinson poster on the ceiling over my bed, but my husband vetoed that idea. Oh it's such a boy's room! LOL!